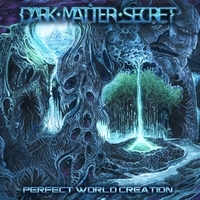 DARK MATTER SECRET is a new name and a new hope for instrumental bands. It is a band that hails from Russia and one that is currently amongst my most anticipated releases from the new but highly and quickly rising The Artisan Era label! The band is about to unleash their long awaited debut record next month, and I must say that I’m in that group of people that has truly enjoyed their debut material a lot, and am currently pretty stoked to hear 7 brand new songs from the band. My very first introduction to them, and I assume many other people too, was through the two track 2015 single entitled “Xenoform”. It consisted of two tracks, the first one being “Unhuman Lifeform” & “Xenotrans”. Both were pretty lengthy, but what impressed me the most, and what made me listen to that band daily on Bandcamp, was their super sweet sound. Their sound could be best described as a beautiful mix of Progressive and Technical Death Metal, which is vocal-less and is completely instrumental; and features a fretless bass! The latter is the key of the entire atmosphere. That beautiful, loud, and sharply clean bass sound is simply perfect with the combination of progressiveness and technicality. The band wasn’t formed that long ago, and it is the three members - Denis Shvarts on guitars, Pavel Semin on the fretless bass, and Andrey Ischenko on the drum kit - that are the architects behind this band who are about to release the the brand new “Perfect World Creation” entitled record! As previously mentioned, the record consists of seven tracks, most of them being ultra long and ultra complicatedly-named. Nevertheless, it is still a record you should definitely be stoked for, at least if you’re a fan of this mighty genre. “Chaos Born” is the first thing I experienced. It is a nice intro, pretty creepy, but still nice, since it has this little space oriented theme feeling to it and a nice little guitar intro. “Ancient Gods Genesis” unleashes the monstrous guitar riffs upon us all, and there are so many moments where I was almost a hundred percent certain that I would hear vocals, but I was terribly wrong. Still, I am really a fan of instrumental projects, and seeing this band that has created this record, I must say that they are doing absolutely nothing wrong; and that this sound has been explored in the past all that much - hats off for what they are doing. Explore some beautifully melodic and brutally technical riffing here on the second track, and dive into this magical world that this band have successfully created in their sound. I was truly shocked! I loved how the overall atmosphere felt so alien-y, space-y, and so magically atmospheric. I loved how I could enjoy the guitars toned fully up and still clearly hear the beautiful sound of the bass. What I also adore is that the band, although fast, they really don’t focus too much on speed, but more on their overall technicality, and they try to impress the public with both slow and fast moments - they already have a fan. Some riffs are heavier, some remind you of OBSCURA, some of BEYOND CREATION, and some sound like the also instrumental Russian band ALIEN GARDEN. The bass sounds so playful and kind of blues-y, but still heavy in its own way. “Emergence of Time” is also a slower song, which patiently builds up the overall atmosphere and really slowly lets out the raging riffs. They dominate only from time to time, and sometimes the slowness takes over, yet the band lacks no technique, not at all. “Synthesis of Matter” is one of the faster songs, and I must say it has become my favorite; it’s a song that I will definitely blast more in the future. The drums are incredibly furious and everything is incredibly fast and sped-up - big fan of this song. Some of the parts sound like an incredibly fast Technical Grind-Core project! “Constellation Glows” has an even higher guitar tone and more bass - I seriously can’t get over how good the bass guitar sounds. Things seriously get out of hand, and I must say that all these dizzy riffs and all this wondering sound on this song makes me say that this has to be the most progressive song of them all. Something you guys can also listen to is a song that is currently only available on Youtube entitled “Organic Nucleation”! Check it out, and you’ll see that it’s only a brutal teaser of what’s to come. Not much to say about that song, being that it’s the penultimate one. It’s still a track worthy of listening, because as I would suspect, its job is to prepare us for the very last and probably best experience on the whole record! It’s an eight-minute song, so enjoy it with all the "trippy" lights in the official music video. Hats off for the label’s mastermind for creating such a "trippy" yet incredibly interesting music video that actually keeps the attention of the listener and lets him focus on the music! The end comes along and “Perfect World Creation” makes its arrival. The title track! What could this song provide? Let’s see. Wow…a dissonant but still such a hauntingly wonderful song. Everything fades out somehow, everything is less sped-up and is somewhat slowly tuned down, making this a bizarre song with a brutal background; this is still my second favorite of them all. If you’re a fan of EXISTENTIAL ANIMALS, CONQUERING DYSTOPIA, VIRAEMIA, NECROPHAGIST, definitely get yourself on this! This record deserves the 10/10, and I hope that I won’t be the only one giving it this rating. Enjoy!